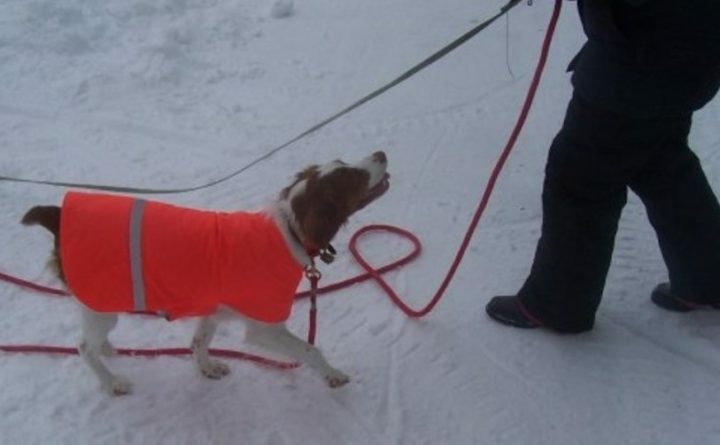 Sassy, owned by Julie Harris of Hermon, is letting Harris know she is ready to run on Moosehead Lake. Most bird dog training equipment is really static and maybe even rigid in how it is used. But one piece of equipment — the check cord or long line — is as versatile as my Brittany bird dogs are. A check cord, which is a length of rope 15 to 50 feet long with a snap clasp on one end, is perfect for training the novice dog to quarter — move in a side to side sweeping pattern in front of you — or for making the intermediate dog think he is tethered to you when he actually isn’t, or to let an old dog hunt the edges of fields and woods safely. It can be used to teach recall, “whoa” — stopping to point a bird — or to retrieve birds. Or as a quick tie-out when away from home. The length, heft and material of a check cord will be determined by how you intend to use it and how old your dog is. For example, a puppy should not drag around anything too heavy in order to avoid permanent damage to growing limbs and joints. I have a lightweight, 15-foot cotton web lead, handmade in Maine, that I use with puppies. It’s long enough that I can grab the lead on its way by me if I’ve let it go, or if I decide to hold onto it while I let pup discover a live bird in the grass on his own. It’s a limited-use lead for me, but perfect each time I have a new pup. Sassy, owned by Julie Harris of Hermon, swims at the end of a 50-foot-long check cord attached to her harness to prevent her from swimming away and not returning when called. I have other check cords that I’ve acquired as my training knowledge has increased. One is a 50-foot Fat Yard Trainer I purchased from Lion Country Supply. It is a softer material than most check cords, making it a little less abrasive on my hands, and the fatter than normal rope makes it easy to grab. It is red, which increases visibility in natural settings. Another is a 15-foot Hi-Visibility check cord that is great for exercising my bird dogs at events where we have limited space for such things and up-close field work. It is my first official check cord and it once was a very bright yellow, although it has faded with time. It’s fairly stiff, so it doesn’t fetch up on debris in the woods as easily as the softer fat trainer. My favorite is a bright orange, fairly lightweight, 50-foot check cord that I special ordered from Lion Country. It has become my go-to check cord for most things, from yard work to travel exercise rope. One special feature is that it floats, which makes it perfect to attach to my dog Sassy, who loves to swim but dislikes coming when called. 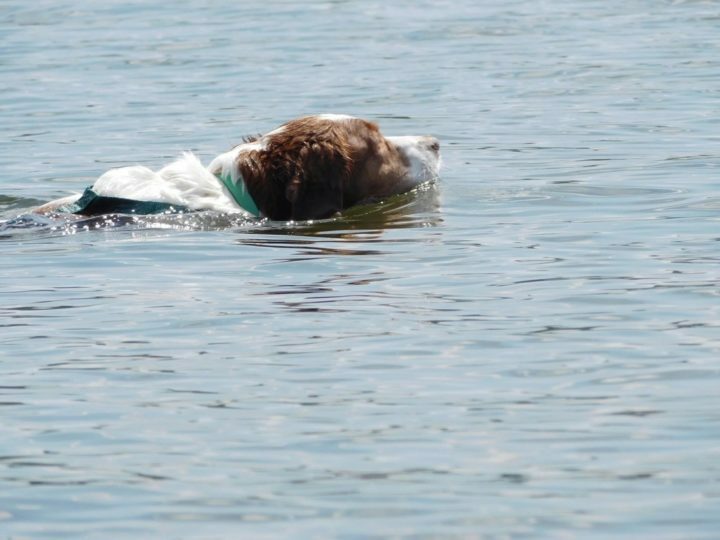 Sassy would swim in the huge lake where we have a camper until she drowned if I did not have a check cord clipped to her harness, as she tried to prove to my husband and me several times when she was a young dog. We finally just made it a rule: Sassy had to swim from the end of a check cord. This meant I had to stand thigh- to waist-deep in the often chilly water to hold the end of the cord, making sure she didn’t get distressed while treadmilling in the water. Last summer, I had to add a dog flotation vest because at age 12, she tires more easily, even though she’s as strong-willed as ever. — The right check cord is a personal decision based on the dog and human who will use it. Experiment until you figure out what length and material works for you. Just because a great trainer says you should use a specific cord at a specific length doesn’t make it the right one for you. — Bird dogs sometimes don’t like check cords. The cord may feel heavy or get tangled in their feet. Some just freak because they think the cord is “after” them. These dogs need extra patience and training on how check cords are not to be feared. — Check cords, which basically are woven fibers of some sort, get disgustingly dirty and are best laundered outside with a hose equipped with a spray nozzle. — Even the no-tangle check cords get tangled, in creative ways, and short ones are as apt to tangle as long ones. — Not all check cords float well. — Make sure you have a well-made bolt-snap clasp on the end of your check cord that will not open or fall apart easily. It may be all that is between you and an afternoon of looking for your dog. — You can never have too many check cords. The one you want is always at home on a peg or mistakenly left at camp. — When the dog gets used to the check cord and has some idea of what he is supposed to do, don’t be afraid to let him run loose while dragging the cord as long as you are in a safe place for him. He is used to you being on the other end of it and is likely to make that association even when you don’t have it in your hand. It’s a good step between no trust and full trust. — Even the softest ropes burn like the dickens when pulled through your hands by a bird dog going full screech. — And finally, puppies love to grab check cords that are attached to adult dogs. It makes them feel powerful.